Vice President-elect Mike Pence walks past the media as he leaves Trump Tower, Tuesday, Nov. 15, 2016, in New York. 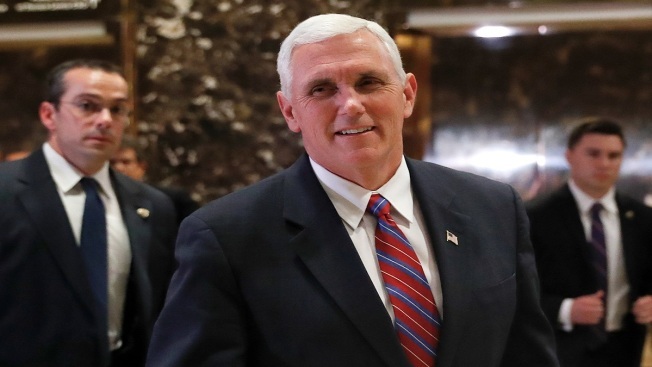 Vice President-elect Mike Pence said he wasn't offended when he was challenged by the cast of the Broadway hit "Hamilton" and encouraged everyone to try to see the sold-out show. Pence attended the show Friday night with his daughter, and said he heard some people in the audience cheer and others "boo" at his presence. Pence told "Fox News Sunday" that he told his daughter, "that's what freedom sounds like." At the end of the show, actor Brandon Victor Dixon challenged Pence from the stage, saying the cast was concerned about the Trump administration. President-elect Donald Trump on Twitter demanded that the cast apologize and suggested the show was overrated. In his interview Sunday, Pence said Hamilton was an "incredible production" involving a very talented cast. On whether he thinks an apology was necessary, Pence said: "I'll leave it to others whether that was the appropriate venue to say it."